"She Will Be Loved" is a song by the American pop rock band Maroon 5. It was written by frontman Adam Levine and lead guitarist James Valentine. The song was released on June 8, 2004, as the third single from Maroon 5's 2002 debut studio album, Songs About Jane. The single peaked at No. 5 in the United States and by December 2012 had sold more than 2,722,000 digital downloads. It peaked at No. 4 in the United Kingdom. In Australia, it reached No. 1, a position it held for five non-consecutive weeks. The single is noted for its music video starring Kelly Preston in a mother-daughter love triangle with lead singer Adam Levine. The song proved as successful as the band's previous hits, "This Love" and "Harder to Breathe", hitting No. 1 on the Mainstream Top 40 and Adult Top 40 charts, but it prompted many alternative radio outlets to remove Maroon 5 from their playlists, on the ground that the band's newer songs were too light for alt-rock audiences. These stations continued to play "Harder to Breathe" and "This Love", but Maroon 5's newer hits were played only on pop and adult contemporary stations. As of June 2014, the song has sold more than 3 million copies in the United States. "She Will Be Loved" entered the Billboard Hot 100 at #50 as the Hot Shot debut of the week on July 24, 2004. The song rose to No. 20 on August 21, 2004, giving Maroon 5 its third consecutive Top 20 hit on the chart. "She Will Be Loved" continued to gain in performance and rose to #9 on September 11, 2004, becoming Maroon 5's second top-ten hit from Songs About Jane after the band's previous hit "This Love". The song reached its peak position at No. 5 on September 25, 2004, matching the peak position of "This Love" from earlier that year. It fell to No. 6 a week later and stayed in that position for three weeks, before rising back up to #5 on October 23, 2004 for two more consecutive weeks. "She Will Be Loved" was certified platinum on April 18, 2011 by the Recording Industry Association of America (RIAA) and has sold 3,197,000 copies in the US as of June 15, 2014. The original version of the music video directed by Sophie Muller, which was originally filmed until was later scrapped to re-shot with the new version. In the video, Maroon 5 performed the song with scenes of them are rotating, similar to the band's other video for "Harder to Breathe" and features actress Elisha Cuthbert as the love interest of lead singer Adam Levine. The official music video for "She Will Be Loved" premiered on MTV's Total Request Live on July 16, 2004. This version was directed by Muller, with original sequence by Johanna Bautista (Sweetheart Massive Attack) tells a sad love story, featuring a lovelorn socialite (Kelly Preston) and her rich, deadbeat, abusive husband, whose relationship is juxtaposed with that of their daughter's (Corinne Carrey) relationship with a young man (played by Levine). The younger man, however, constantly obsesses over his girlfriend's mother, understanding that, although she is constantly rejected by her husband and that her life is one of emotional anxiety, she is nonetheless beautiful and attractive, and possibly more so than his own girlfriend. The video is often compared to the 1967 film The Graduate, as it has similarities with the storyline between the daughter, the boyfriend and the mother. The version of the song used in the music video is the radio mix version found on the 10th anniversary edition of Songs About Jane. The video starts with Levine standing in front of a swimming pool. As he's about to dive in, flashbacks appear: a younger woman swimming in a pool, Levine and the younger woman sharing a kiss, Levine comforting another woman who appears to be in distress, the older woman hiding alone in her car, and the older woman embracing the young man. Levine dives head first into the pool, but then somehow is feet first submerged underwater, completely unaware of what's to happen to him in falling in love that summer. Flashbacks show the two women walking side by side in the city as someone watches them from his/her car and all three protagonists are face to face, hinting at events that will ensue. After that, the young man and his girlfriend visit her home and dive into a swimming pool kissing. After they resurface from swimming, the young man looks to his girlfriend as she's being cared for by another woman who is revealed to be the girlfriend's mother. The mother helps her daughter dry from swimming and glances in the young man's direction. As the young couple relax at her parent's social gathering, everyone, except the young man, is oblivious to the reality that not everything is right in the mother's relationship with the much older man. One night while walking down the stairs, the young man discovers someone lying unconscious in the room. Recognizing the unconscious to be the mother, he goes to revive her and discovers that she's been abused by someone (judging by the red lipstick smeared across her face and other signs of physical abuse). The mother awakens and inexplicably kisses Levine, who returns her affections. Flashbacks show that the mother was beaten by her husband moments earlier. After the encounter, the young man appears to become infatuated, parking his car outside a building one day to watch the mother and the daughter shop together, seeing how they're laughing and having a great time. The mother also appears to become infatuated, parking her car outside the young couple's house one night to watch him. After a discussion with his girlfriend, Levine sees the mother watching him from her car and she waves at him. When Levine and his band perform "She Will Be Loved" during a concert at the bar lounge, his girlfriend watches from the crowd. However, Levine sees the mother looking back at him instead of his girlfriend. When the young couple dance together, he fantasizes about being with the mother. Later that night, the mother is found to be in the bar wearing a red dress and makeup. As she watches him, Levine looks at the mother, then looks at his girlfriend smiling at him and ponders about the complicated situation. Having still gained no romantic attention from her husband and seeing the young couple together, the mother was frustrated and overcome with emotion. She walks away crying. Levine follows her to console her and they embrace, nearly kissing until his girlfriend catches them. The story and song is about how he tried to end the affair with the mother but realising if he ended it, the mother and himself would be completely distraught and disappointed. The story also tells that he truly loves his girlfriend but the feelings for the mother are just too strong for him to ignore therefore he realises that he is falling in love with his girlfriend’s mother and cannot bring himself to decide on who he wants to be with amongst the two as he appears to love both women wholeheartedly. In 2005, the song was nominated at the 47th Annual Grammy Awards in the Best Pop Performance by a Duo or Group with Vocals category. "She Will Be Loved" was featured on television shows, One Tree Hill, Medium, Smallville, Dancing with the Stars, Laguna Beach: The Real Orange County, House of Lies, What I Like About You and The Sopranos and the 2010 romantic drama film The Last Song. The song appeared in the video games Rocksmith, Band Hero and Lips: Party Classics. Two different versions of the song were featured: an acoustic version that appeared on Maroon 5's live album 1.22.03.Acoustic (2004), and a Cuban version from the album Rhythms del Mundo: Cuba (2006) by Rhythms del Mundo. Australian singer Kate Ceberano recorded a cover version for her album So Much Beauty (2008). "She Will Be Loved (Album version)" – 4:36* [*although single back cover and inlay CD states Album version length at 4:36, they made a misprint: it is the standard 4:18 that can be found on every other CD single containing Album version track]. ^ Paul Grein (December 5, 2012). "Week Ending Dec. 2, 2012. Songs: will & Brit". Chart Watch. Yahoo Music. ^ "The Hot 100: The Week of July 24, 2004". Billboard. Prometheus Global Media. Retrieved September 19, 2015. ^ "The Hot 100: The Week of August 21, 2004". Billboard. Prometheus Global Media. Retrieved September 19, 2015. ^ "The Hot 100: The Week of September 11, 2004". Billboard. Prometheus Global Media. Retrieved September 19, 2015. ^ "The Hot 100: The Week of September 25, 2004". Billboard. Prometheus Global Media. Retrieved September 19, 2015. ^ "The Hot 100: The Week of October 2, 2004". Billboard. Prometheus Global Media. Retrieved September 19, 2015. ^ "The Hot 100: The Week of October 23, 2004". Billboard. Prometheus Global Media. Retrieved September 19, 2015. ^ "The Hot 100: The Week of October 30, 2004". Billboard. Prometheus Global Media. Retrieved September 19, 2015. ^ "Maroon 5 – She Will Be Loved (Original Version): Behind the Scenes" – via YouTube. ^ "Maroon 5 – She Will Be Loved (Original Version)" – via YouTube. ^ "Kelly Preston stars in new Maroon 5 video 'She Will Be Loved'". Top 40-Charts.com. July 16, 2004. Retrieved November 6, 2018. ^ "She Will Be Loved | Maroon 5 | Music Video". MTV. Viacom Media Networks. Retrieved July 31, 2012. ^ "Maroon 5 - She Will Be Loved (CD)". Discogs. Retrieved September 14, 2015. ^ "Maroon 5 - She Will Be Loved (CD)". Discogs. Retrieved October 2, 2015. ^ "She Will Be Loved: Maroon 5". Amazon.com. Retrieved September 14, 2015. ^ "Maroon 5 - She Will Be Loved / Sunday Morning (Vinyl)". Discogs. Retrieved October 2, 2015. ^ "Australian-charts.com – Maroon 5 – She Will Be Loved". ARIA Top 50 Singles. ^ "Austriancharts.at – Maroon 5 – She Will Be Loved" (in German). Ö3 Austria Top 40. ^ "Ultratop.be – Maroon 5 – She Will Be Loved" (in Dutch). Ultratop 50. ^ "Ultratop.be – Maroon 5 – She Will Be Loved" (in French). Ultratip. ^ "Lescharts.com – Maroon 5 – She Will Be Loved" (in French). Les classement single. ^ "Offiziellecharts.de – Maroon 5 – She Will Be Loved". GfK Entertainment Charts. ^ "Chart Track: Week 35, 2004". Irish Singles Chart. ^ "Italiancharts.com – Maroon 5 – She Will Be Loved". Top Digital Download. ^ "Nederlandse Top 40 – Maroon 5" (in Dutch). Dutch Top 40. 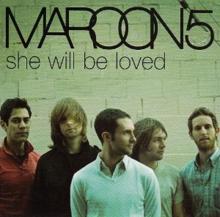 ^ "Dutchcharts.nl – Maroon 5 – She Will Be Loved" (in Dutch). Single Top 100. ^ "Charts.nz – Maroon 5 – She Will Be Loved". Top 40 Singles. ^ "2015년 42주차 Digital Chart" (in Korean). Gaon Music Chart. October 10, 2015. Retrieved October 17, 2015. ^ "Swisscharts.com – Maroon 5 – She Will Be Loved". Swiss Singles Chart. ^ "Maroon 5 – Chart history". Billboard Rock Digital Songs for Maroon 5. Retrieved October 17, 2015. ^ "Pop Rock". Record Report. November 13, 2004. Archived from the original on September 24, 2011. ^ "Top 100-Jaaroverzicht van 2004" (in Dutch). Retrieved September 6, 2015. ^ "End of Year 2004" (PDF). UKChartsPlus. Retrieved September 6, 2015. ^ "2004 Year End Charts – The Billboard Hot 100 Singles & Tracks". Billboard. Prometheus Global Media. Archived from the original on October 1, 2012. Retrieved October 10, 2015. ^ "2004 Year End Charts – Hot Adult Top 40 Singles & Tracks". Billboard. Prometheus Global Media. Archived from the original on October 9, 2012. Retrieved October 10, 2015. ^ "2004 Year End Charts – Top 40 Mainstream Titles". Billboard. Prometheus Global Media. Archived from the original on October 4, 2012. Retrieved October 10, 2015. ^ "MAHASZ Rádiós TOP 100 - 2005" (in Hungarian). Rádiós Top 40 játszási lista. Magyar Hanglemezkiadók Szövetsége. Retrieved February 13, 2016. ^ "2005 Year End Charts – The Billboard Hot 100 Songs". Billboard. Prometheus Global Media. Archived from the original on September 27, 2012. Retrieved October 10, 2015. ^ "2015년 Digital Chart" (in Korean). Gaon. Retrieved January 29, 2016. ^ "Decade End Charts – Adult Pop Songs". Archived from the original on October 9, 2012. Retrieved October 10, 2015. ^ "Greatest of All Time Adult Pop Songs". Billboard. Prometheus Global Media. Retrieved March 30, 2016. ^ "Canadian single certifications – Maroon 5 – She Will Be Loved". Music Canada. ^ "Italian single certifications – Maroon 5 – She Will Be Loved" (in Italian). Federazione Industria Musicale Italiana. Retrieved January 15, 2018. Select "2018" in the "Anno" drop-down menu. Select "She Will Be Loved" in the "Filtra" field. Select "Singoli online" under "Sezione". ^ "British single certifications – Maroon 5 – She Will Be Loved". British Phonographic Industry. Select singles in the Format field. Select Platinum in the Certification field. Type She Will Be Loved in the "Search BPI Awards" field and then press Enter. ^ "American single certifications – Maroon 5 – She Will Be Loved". Recording Industry Association of America. If necessary, click Advanced, then click Format, then select Single, then click SEARCH. ^ "Certificeringer – Maroon 5 – She Will Be Loved" (in Danish). IFPI Denmark. Retrieved January 4, 2016.